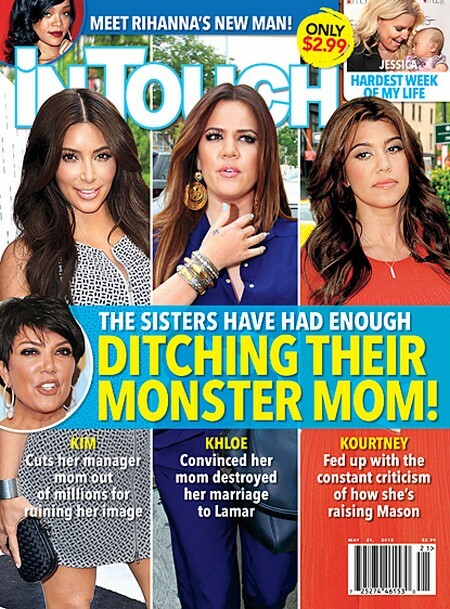 According this week’s In Touch the Kardashian sisters Kim, Khloe and Kourtney have had enough of their manager Kris Jenner stealing 10 % of their earnings and butting in their lives. Kim feels Kris is ruining her image. It has been rumored that Mom Kris is the reason that Kim filed for divorce so soon from her husband Kris Humphries. That is just one of the reasons Kim is going to cut her out of her millions that Kris has been grabbing from her. Khloe is convinced that Kris destroyed her marriage to Lamar. While Kourtney is just fed up with the constant criticism from Kris, on how she is raising her son Mason. In Touch has the scoop: It was supposed to be a family affair — a chance for Kris Jenner to bask in her success, surrounded by the children she’s worked so hard to transform into reality superstars. But two of her three grown daughters were noticeably absent at New York’s Villa Pacri, where Kris celebrated signing a whopping $40 million contract for three more seasons of Keeping Up With the Kardashians. So there seems to be a feud brewing in the Kardashian Dynasty. As we reported last week Kim feels she has been cheated out of millions of dollars by her mother, the infamous momanager Kris Jenner. It would not be a surprise if the girls gave Mom Kim the boot! What do you think about all this should the Kardashian girls give Mom Kris the ‘heave ho?’ Hit the comments and let us know your thoughts!